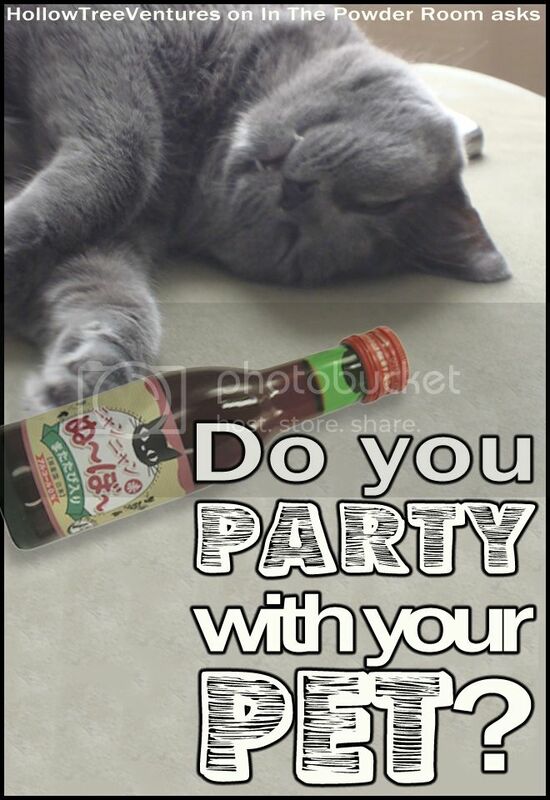 Do you party with your pet? I've long suspected that my cat might be trying to kill me, based on how he trips me on the stairs and lurks in dark rooms waiting to scare me to death—but recent news suggests he might actually be trying to become me. It seems my furry feline friend is attempting to steal one of my favorite vices, and I can't help but wonder—what's next? Tiny four-legged yoga pants? Grumbling obscenities at inconsiderate cats who cut him off in traffic? Is he going to start his own blog??? Let's discuss whether or not Chauncey (pictured below, on a bender) and I will be knocking back a few frosty beverages together, thanks to Japan's latest offering to the animal kingdom: wine for cats. If you've ever dreamed of getting hammered with your pet (And frankly, who hasn't? ), then you're in luck. A Japanese company, B&H Lifes, has rolled out a special wine just for cats. I believe I speak for all of humanity when I say, "FINALLY!" Oh wait, I pronounced that wrong. I meant to say, "What in the ever-loving hell?!?" Yes, you heard me. Wine. For your cats. I say "cats," plural, because I assume anyone buying this stuff has more than one. It's called Nyan Nyan Nouveau, which is Japanese for "people will buy, seriously, just about anything," and opens up the long-awaited possibility of partying with all the animals in your house. Because naturally you've already been pounding back the Bowser Beers with the family pup. No? You don't chug frosty brews with your dog? And you call yourself an animal lover. Okay, so there's no actual alcohol in either of these beverages (sorry, Fluffy and Fido) but the feline wine does contain catnip and the pooch hooch contains meat, which is about as high as your pets are ever going to get (legally, anyway). I'm not sure how popular Nyan Nyan Nouveau is expected to be, since they're only making 1,000 bottles (Hurry, order now - operators are standing by! ), but B&H Lifes claims there's a market for beastly booze due to the many requests they get from customers who want to "celebrate Christmas and birthdays" with their cats. I mean, I get it—a pet is part of the family. But if your cats are anything like mine, they think every day is their birthday, and they celebrate Christmas by climbing into the tree until it falls over and crashes onto the television, then freaking out and barfing on your shoes. Which is to say, cats don't seem to need a bottle of wine to feel special and act drunk. So, it's not really a product for the pets—like designer dog houses and wedding cakes for kitties, running a tab for a tabby is more for the owners' enjoyment. But the idea of some singleton out there pouring wine into a cat dish while she softly hums "happy birthday to me" and adjusts the elastic string under her cat's pointy party hat makes me so depressed, I'm going to have to go drink my own wine directly from the spigot on the box. And no, kitty, I won't be sharing. Labels: animals, booze, culture, gift idea, humor, In The Powder Room, pet peeves, That Can't Be Right, That's messed up., What did you say?